I found interest in Snooker about more than a decade ago when I first saw a match on ESPN. At first, I thought it was a game where it would be boring as it was a longer version of a normal 9-Ball tournament. That’s what I thought! The game itself has a higher level of strategy needed as the table will be cluttered with lots of balls. The game is played on a rectangular table, just like in Billiards but in a larger table to fit all the balls inside. Today snooker is being played professionally and of course, has gained its reputation as one of the sports to bet upon today. Without further delay, let us talk about the basic rules of snooker. You are only able to hit the cue ball (white) to pot the other colored balls on the table. If you mistakenly pot the cue ball, this is considered a foul and the possession will go to the opponent. On each player’s turn, they need to hit the red balls first then followed with the colored balls. Once a red ball is potted, you may now hit the colored balls; but before hitting any colored balls you need to declare which color you want to hit. The order of colored balls should go as Yellow, Green, Brown, Pink and then Black. These should go through succession and red balls should be hit first before any of the mentioned colors above. Of course, the player with the highest points wins the game. You are able to read more about the scoring system of Snooker here. Snooker can be either played in singles or doubles. In most cases, the singles game are usually posted as the only available games to bet on within the Sportsbooks that are being mentioned below. In order to win your next game of snooker betting, you need to know a few important things. Knowledge – As mentioned above, you need to know the basic rules of Snooker in order to actually understand the game and be better in predicting game outcomes by watching previous match replays in streaming websites. Learn the game by heart so that you would be able to determine if that player is good or not with just one single shot. Best Players – Of course, Snooker is a skill as the game is not easily learned if you do not know how to play Billiards. It is great to know a few people that have been doing very well in the Snooker world to know which caliber these players are at now. This would be very helpful in identifying which persons to bet against. Tournaments – Different tournament levels would also mean different odds and game availability. Since there are a lot of Snooker tournaments in the world, it would be easy for us to bet on the game without thinking about seasons and leagues. Snooker has certain rules that must be followed. It is an announcement and point game. The player has to pot a red and a different coloured ball alternately; each ball has a certain number of points, which must also be observed. Inform yourself about the rules, the game material and the origin of snooker. The player with the most points wins the game. Tactically wise is to position the white ball in such a way that the opponent has as much difficulty as possible in reaching the next ball to be played – in this case we are talking about snookers (“obstructing”). The game is over as soon as all object balls are off the table. But there is another way to end the game or the set: If there is a difference of more than seven points and only the white and black balls remain at the snooker table. Each snooker game consists of several sets. The number of sets is determined in advance; whoever wins more than half wins the match. In most tournaments there is always an odd number of sets to avoid a draw. In league games, however, the even number of sets may result in a draw. The value of a ball is added to the player’s score as soon as the player pounds the ball. First, a red ball must always be played. The player can then decide which other coloured ball he wants to sink. If he does not succeed, the other player has the possibility to pocket several balls in a row. If there are only balls of a different colour on the snooker table, the player must always start with the lowest value ball at the end of the game. It is interesting to note that the coloured balls are returned to the table after they have been pocketed – on the specified starting positions. However, the red balls remain in the pockets after they have been pocketed. If the last red ball is sunk, another ball of a different colour may be played. When all red balls are gone, you have to start with the lowest value ball. If a player does not have the opportunity to pocket a ball according to the rules, he must try to snook his opponent. This means that he places the ball in such a way that the opponent cannot play the ball directly and must therefore choose a more complicated move. A snooker often makes the opponent nervous, making mistakes or fouls. The winner is the player who has more points. As with most other sports and games, there are several terms used by professionals in snooker. If you watch a snooker broadcast or play snooker yourself, you should know at least some of these terms. Ball On is the ball that can or must be played next. A break is a series of points that can only be scored if you are at the snooker table all the time. A set of a match is called a frame. A match consists of a predetermined number of frames. The player with the most points in a frame wins the set. A frame is considered finished when all balls have been sunk. A set can also be finished if there is only the black ball at the table and one player has more than seven points than the other player. Snooker also has fouls. These are shocks that violate the rules and are punished. Who commits a foul, must count on the fact that the opponent four to seven points are credited. If the player has tried to take a shot incorrectly, a miss will be awarded after the foul. The opponent may have the referee return the balls to their starting position. In snooker it can happen that two balls stick to each other when colliding, this is called kick or bad contact. There can also be stuck situations, where a positive development of the frame is no longer to be expected, then the two opponents can agree on a re-rack – the balls are set up again and the frame begins again. We speak of a touching ball when the playing ball remains on a ball On. The player does not have to play a ball on anymore, but can punch a ball on or play another ball. The Maxium Break is a break of 147 points. This is possible if you have one black ball to each of the 15 red balls and then sink all seven colours. At a “festival”, when a meaningful further development of the game cannot be foreseen, an agreement may be reached on a new placement of the balls. In this case there is a new game. If there is no agreement, the referee can order a re-rack. If you know all these expressions, you will find your way around a snooker game very well and also be able to follow every transmission of a snooker game without problems. If you play snooker yourself, you will learn the meaning of the different terms over time. Snooker is considered a gentlemen’s game. Both the clothing and the fair play are of utmost importance and can decide whether someone is worthy of the Snooker at all. The first forms of snooker existed more than two hundred years ago. However, the billiard variant did not find its present form until the 19th century. Around 1875 English colonial officers in India played snooker full of passion. Since these days snooker is a game for gentlemen. The Snooker world federation feels committed to this ideal to this day. This includes strict clothing regulations, but also impeccable behavior at the table. Snooker players are expected to display these errors on their own. Many mistakes are often only noticed by the players themselves. This concerns, for example, the puncture (after the actual impact the cue still has contact with the playing ball) or the accidental touching of balls with clothing. The balls of the snooker are therefore considered “gentlemen testers”. A player who touches an object ball with his clothes can hardly tell if the spectators have noticed this. If they have noticed the violation, which is not reported by the player, the player is considered unworthy to play snooker. With the Snooker it depends just like with the closely related billiards on precision and skill of the players. Since the snooker game is technically even more difficult, the snooker players have to aim even more precisely and consider every move well in advance. Also the game material differs slightly from the game material of billiards. The snooker tables, which weigh up to 1,500 kilograms, are about 3.556 millimetres long and 1.778 millimetres wide. The dimensions of individual tables can be 13 millimeters larger or smaller. There is a solid line, a touch-up mark, head and foot bands. Snooker tables are made of a slate plate, with a specially brushed green worsted cloth on top at tournaments. So that the balls can run out of the bands in a controlled manner, the bands are fitted with natural rubber. Baulk-Line (a D is recorded in the kick-off point) for the yellow, brown and green ball. The red balls are placed as close as possible to the pink balls without touching them. The extensions are used by the players when they would otherwise not be able to reach the ball due to the size of the snooker table. Also the Snookerballs differ from ordinary billiard balls. They are made of phenolic resin and have a diameter of 52.5 millimetres. Most snooker balls weigh between 130 and 150 grams. 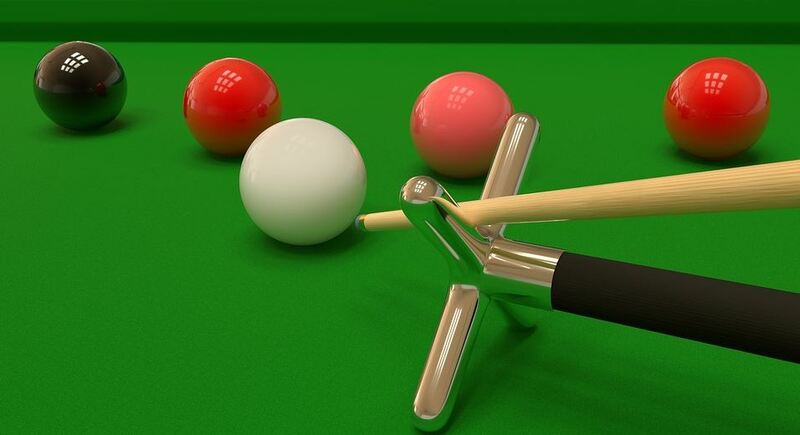 The white ball is the playing ball and is the only one that can be touched with the cue. Snooker cues are usually made of ash or maple, i.e. very hard wood. At the handle the cue is thicker than at the tip. Snooker cues must be at least 91 centimeters long, but most are between 140 and 150 centimeters long. There are one-piece or two-piece models that are connected with a screw thread. In tournaments, the so-called 3/4 pitch is preferred. This means that the front part accounts for 3/4 of the total length. This is because the cue is guided along the chin while you hit a ball. So that the chin does not come into contact with the screw connection, there is the 3/4 division. From time to time it is necessary to extend the cue with an extension of the snooker table to get to the ball. Billiard chalk is also used in the snooker to increase the adhesion of the bitter orange to the playing ball. The increased adhesion can cause rotation, which is necessary from time to time. The snooker game is closely related to billiards. However, it is played with special queues and on a special snooker table. The aim is to sink a total of 21 balls according to certain rules. The history of snooker began with the development of billiards in the 15th century. Originally, the billiard game comes from a game called Pall Mall. It is now extinct. The further development of the queues is responsible for the further development up to the snooker. Around 1807 the queues got leather-covered laces. In addition, the wood of the billiard tables was replaced by another material: slate. When the bands were filled with rubber instead of cotton, the billiard table was born. Snooker, which is closely related to billiards, was created in India at the end of the 19th century. British officers used a variant for the first time, in which 15 red balls and some balls of a different colour had to be sunk. They called the game Snooker Pool. You had to sink one black, one pink, one green, one yellow and 15 red balls with a white play ball. Later, a brown ball and a blue ball were added. The game was introduced to the public in England in 1885 and slowly gained acceptance from there. Between 1908 and 1919 there were two associations in Great Britain, but they had different rules for the snooker game. Only in the middle of the year 1919 the brown and the blue ball became a fixed part of the snooker game. In 1969 they wanted to promote the just introduced colour TV and for this reason they broadcast the first Snooker tournament (Pot Black Cup). This made the game better known. In Great Britain, snooker broadcasts are one of the most popular sporting events alongside football broadcasts. Interestingly, the term snooker has nothing to do with billiards, but comes from a rather negative name for freshmen of the army. In 1927 the first professional world championships took place. Joe Davis won all tournaments and championships until 1946. Since 1963 also amateur world championships take place. Snooker is much more difficult than billiards. Snooker players have to be extremely skillful to move the smaller balls on the larger playing surface into the narrower pockets. If the ball is not played exactly, it will run out of the pocket again.